Hey Clay! just launched Talking Clay. Talking Clay is an interactive modeling clay app that teaches kids step-by-step how to make clay creations (monsters, aliens, animals, and birds). My kids tested it out by making cute penguins. I loved that it got them being creative together while on screen time! Hey Clay is selling a kit to accompany these apps that contains 18 cans of brightly colored air-dry modeling clay. This also includes a promo code to get you started on the apps. Some of the creatures are free but if you want the full apps, they do cost. The apps give kids directions on how to make each creature using digital animation. Each step shows basic shapes for making the creature’s body part. Kids follow along with the steps, working on their motor skills and creativity. The clay included in this set is quite spongy — you could bounce balls of this clay. Cool, right? The Animals app includes horse, cow, sheep and rabbit. The Monsters app contains directions for a cyclops, a hipster, Pi, and more. The Birds app gives you ideas to make a dove, peacock, penguin, and more. Once you’ve made your clay creation, let them dry. When they’re dry, display or play with your colorful creatures. My kids were disappointed that the end picture of a penguin wasn’t the same as how the steps in the directions told the kids to make theirs. (The eyes, for example, were different.) Which meant, they didn’t have the same looking penguin as the app’s image. However, the end results turned out adorable either way so it was all good!! 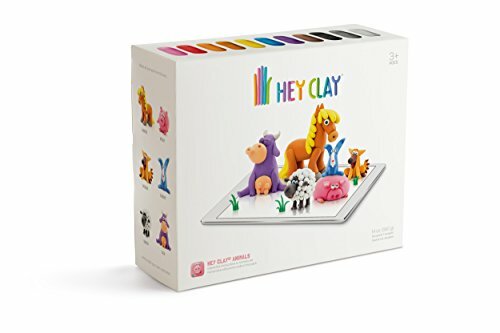 As I mentioned before, I really liked that the Hey Clay apps gave my kids something creative to do — and although it was screen time, it was an interactive activity they could do together. Disclosure: I was sent a free sample of the Hey Clay modeling clay.